As customers, our expectations are increasing and we have zero tolerance for slow websites. According to KISSmetrics, 40% of people abandon a website that takes longer than 3 seconds to load. A few seconds might seem a minimal differentiator by all accounts, but this time lapse can mean the difference between business and referrals, or the loss of a potential sale. If you want users to stick around, you’ll have to spend the time optimising your website speed. A number of factors can influence load speed; image size, low quality plugins and videos. Find out more about the impact of website loading times on your bottom line. Picture this; a visitor arrives on your homepage, greeted with no clear menu or navigation they don’t know what to click or where to go next. In their frustration, they leave and go back to Google search, click on to your competitors site where they easily find the information they need. Navigation seems like a no-brainer, but many businesses fail to provide users with straight forward steps around their site. Not convinced on the importance of website navigation structure? With most people browsing the internet on mobile devices, your site must be responsive to each screen size. Have you ever had to zoom in or scroll over and back to read content on a web page? Frustrating, isn’t it? Not only are you bugging your visitors, Google announced back in 2015 that they would penalise the search ranking of those sites un-optimised for mobile. Smart CTAs – These “personalised” CTAs allow you to display different pop-ups, depending on the type of visitor. For example, if they’re a new visitor, or at a certain stage in the buyer’s journey. Tracking – Monitor the performance of pop up CTAs to identify which ones drive the greatest conversions. From this you can replicate the copy, design and positioning of these top performing pop ups. Copy – Using language that comes across as pushy or guilt tripping will not only dissuade users from clicking your CTA, it could also drive them off your site completely. Try using concise, polite language instead. Yes, visuals are great on your website and throughout your marketing strategy. But when we talk about the importance of imagery, we mean good quality, unique imagery. Website imagery should assist in presenting your company in a good light. Unfortunately, stock photography does the opposite. Not only are stock photos generic, they fail to provide your visitors with a real-life insight into your company, employees, products and workspace. Visitors expect to get a clear understanding of who your company is and what you do from your website. After clicking around only to find minimal information, people will be left with a poor, uninformed impression of your company. The best websites clearly demonstrate their value; who they are, what product/service they offer and exactly how they can help visitors. A good way to approach this is to imagine every visitor has never heard about your company before. Educate them on your brand identity, value and why they should want to work with you. In the past, marketers might have got away with stuffing paragraphs of copy with keywords. Not only was this overwhelming for readers to consume, it’s visual appeal was poor too. Unfortunately, some websites are still using this approach of writing for crawlers instead of humans. However, Google’s algorithm has since evolved in its ability to read page content to determine its relevancy for its users. The search engine now penalises those websites that are clearly stuffing content with keywords to reach the top-ranking position. Of course, keywords are the driving force for Search Engine Optimisation (SEO) success, but including them naturally throughout your content makes for a much better reader experience, plus you’ll keep Google happy too! By not having a blog section on your website, you’re missing out on the chance to offer your visitors educational and promotional content. (never mind the SEO opportunities). When customers search online, they expect to be met with an array of informative, problem solving content that fuels their product/service decision making process. Essentially, when visitors find the answers to their challenges in your content, they’re more likely to trust you when they’re ready to make a purchase. Your website is often the first point of customer contact and the first impression prospects will have of your company. If you fail to impress, you run the chance of frustrating visitors and potentially losing their business. 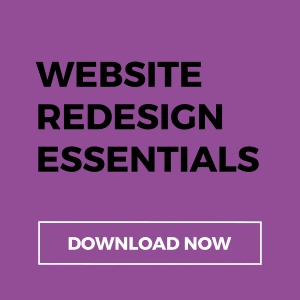 Does your website fall under any of the points listed above? It might be time to consider implementing some changes!